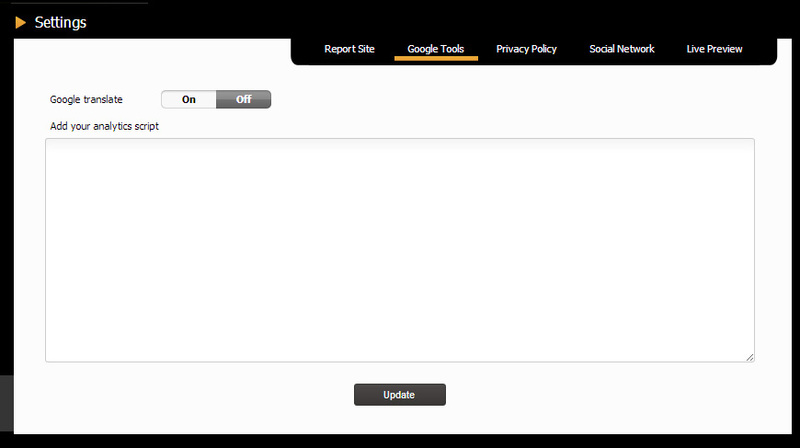 Site Status:Â It magage the status âoff lineâ / âonlineâ. Favicon:Â You can upload the "favicon", it meas theÂ icon displayed in the browser. Title: Â Website title appear in the browser. Description: It allows to write a website description (useful for web search engines). Keywords: Insert âmetanameâ in the site.Â This will often show up in search results. 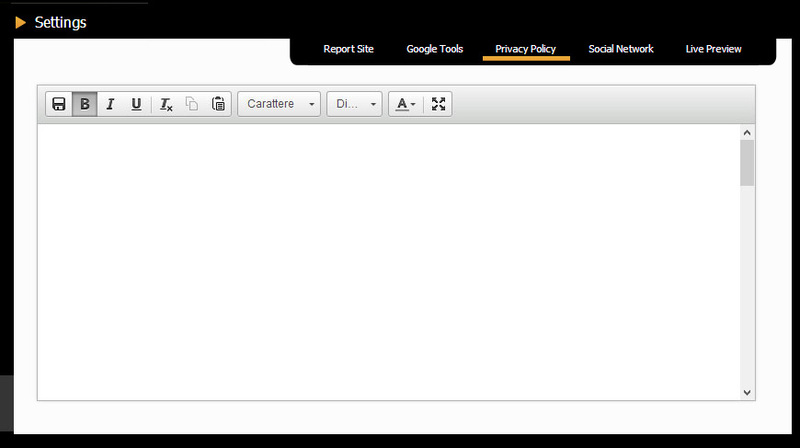 Editor Language:Â Select the language of editor control panel. Website Data Settings: These are the data are displayed in the botton part onÂ the site or in other visible sections. 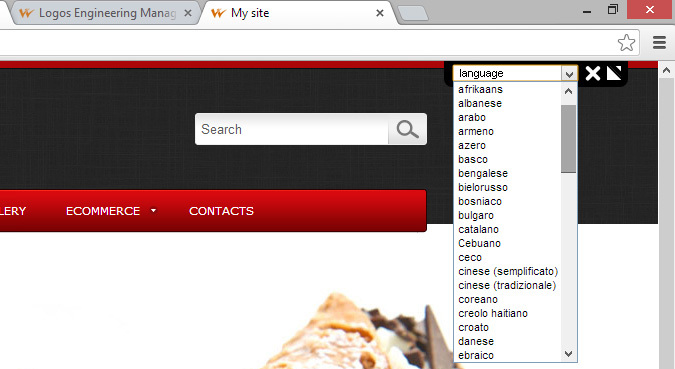 (*)Â Â If you already have an italian site and purchase an addictional language (e.g. English Language), you to click on english flag in 'admin' and 'language editor'Â panel,Â otherwise the text of the form contact will displayed in English language. 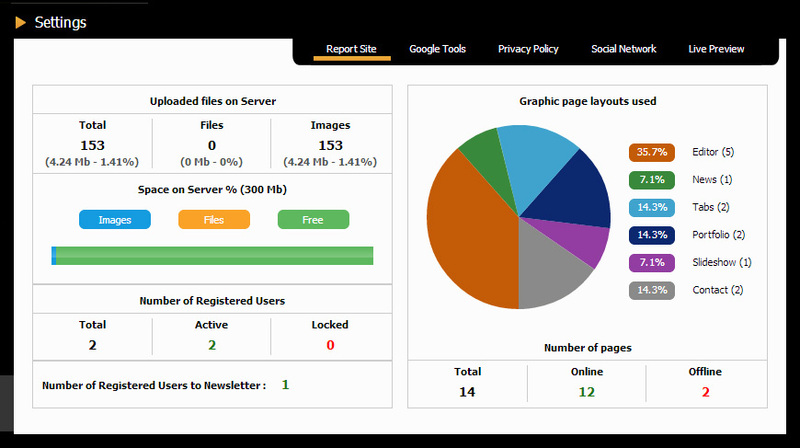 Site analysticsÂ allows to control server space, file and images space. It also shows you a statistic of pages usedÂ . These will be separateÂ in online and offline page. It is possible seeing Â allÂ pages created. There will be tre type of user: registered users, actived users and newsletter contacts. If you enable this important feature will be activated the switch of languages translated by Google. 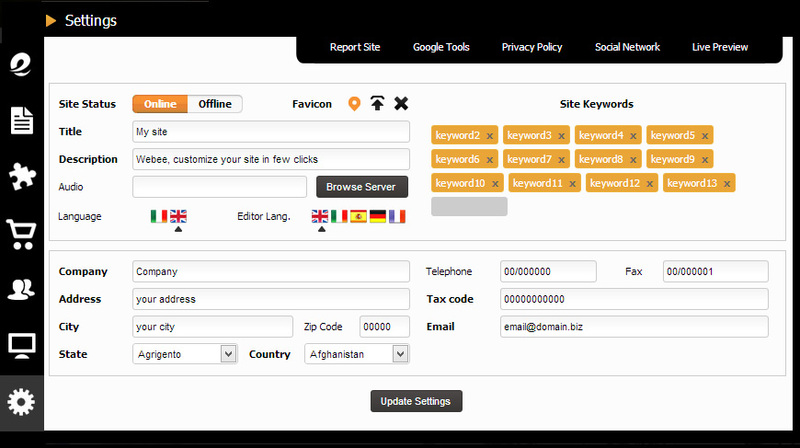 The selector will be displayed at the top right, to translated your website in all languages. privacy:Â It manage the privacy with an editor text where write or to paste texts. 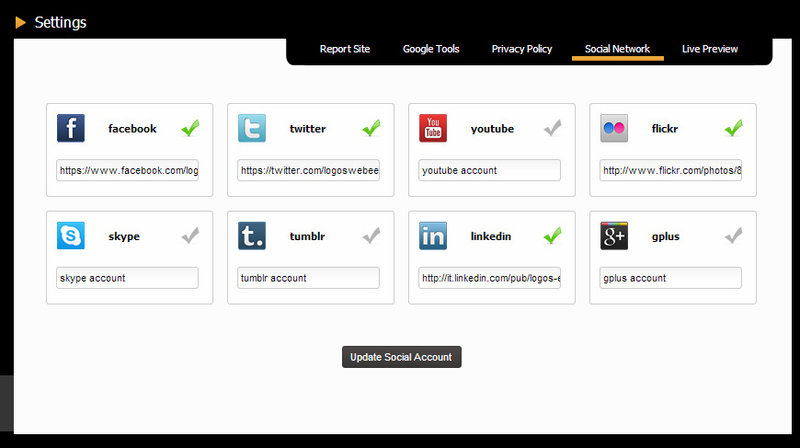 You can to manage your link and the social network. TheseÂ links will be accessible by users clicking on the incons in the footer. To enable the links firstly you have to enter your social network link into the box (as the image below shows), for example:Â https://www.facebook.com/johnsmith.Â To activate the icon you have to click on grey check mark to make it green. To complete the procedure you have toÂ click onÂ "SaveÂ Social Account" button.